It’s very hard to take seriously the idea as stated here. If Wall Street titans had “too much power” over policies regulating the financial industry, it’s hard to see how a lower level of income inequality would have left their relative power much diminished. of asymmetrical information and the revolving door between government and business. 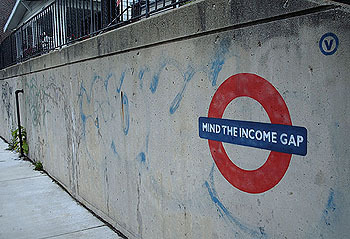 What does the size of the gap between the first and fifth income quintile have to do with it? This is a cramped view. Take a step back and try again. What kind of system would have produced Wall Street titans with less income and less power? Answer: a system in which there were competing power centers that prevented the rise of inequality in the first place. Those same power centers — primarily labor unions, but also public interest groups and the old non-corporate dominated Democratic Party — would almost certainly have fought a lot of the deregulation that ended up proving so dangerous. In other words, it’s not inequality per se that’s the problem, but the system that produced the inequality. A better system that produced wider prosperity would almost certainly have produced a better regulatory regime too. This is, obviously, a counterfactual, and it can’t be proven any more than any other counterfactual. But is it really so hard to believe? A system in which there are countervailing powers with the strength to demand that economic growth be shared broadly is also a system that fights Wall Street’s efforts at deregulation. It’s a system in which the rich have somewhat less vast pools of money to loan out to the working and middle classes. It’s a system in which the incomes of the working and middle classes are growing faster and they have less need to borrow money in the first place. It is, in short, almost certainly a system in which the 2008 financial crisis was, at a minimum, less likely to happen. It is also, unfortunately, not the system we have, and all the legislation of the past two years hasn’t really done much to get us any closer to it. We continue to live in a world in which corporations and the rich have too much power, there’s way too much stupid money sloshing around at the top of the wealth pyramid, and the middle classes continue to stagnate. It ain’t healthy, folks.